when i got here, there were five very young meat chickens sharing the coop with the two dozen or so laying hens (and one rooster) who spend their days clucking around the garden. when i say meat chickens, i mean the kind of chickens bred to be eaten—designed to fatten up and be killed in eight weeks, sorta top-heavy for big juicy breasts and thighs, and with patchy feathers for easier postmortem plucking. now there is one, with a small bloody puncture wound in her side. 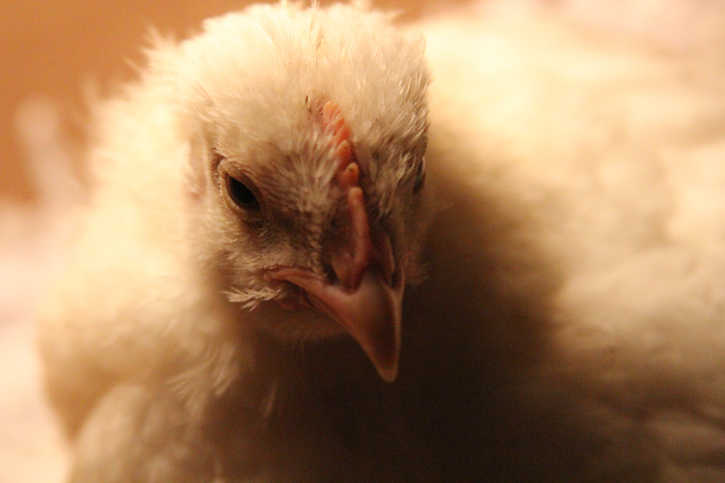 the chicks were encouraged to stay in the coop, under their heat lamp. when the last round of farm homies trained us, they suggested that if we saw one outside the coop, we should put it back in. i guess the chicks were donated by someone, which makes me feel better about the whole thing—i mean that a place like this didn’t seek out chickens who aren’t supposed to do happy chicken things. the first three were killed a couple days ago, sometime in the morning, after the chickens had been let out of their coop but before they’d been let out of their larger enclosure to free-range in the garden and meadow for the afternoon. we all assumed that some predator, a fox or a raccoon or something, had gotten them. then the fourth died, again during the day, with a bloody puncture wound in its side, and we started suspecting the other hens. (one of the first three was more mangled when it was found, but it may have been attacked by another animal after it was hurt or killed by the hens.) when i say we, i mean the general buzz in the community here. i am a little unclear on what exactly happened in what chronological order. i know the remaining chick(s) started spending the day in a little chicken wire cage inside the chicken enclosure (with food, water, and heat lamp) and their night(s) in the chicken coop with the other chickens. at the end of every day, just before or at sunset, the chickens gather in their coop, and we close the gate to their enclosure and the door to the coop. last night, the last few chickens were still milling about the enclosure when we closed the gate, so the door to the coop was left open until a little bit after dark, when someone went down to shut it. 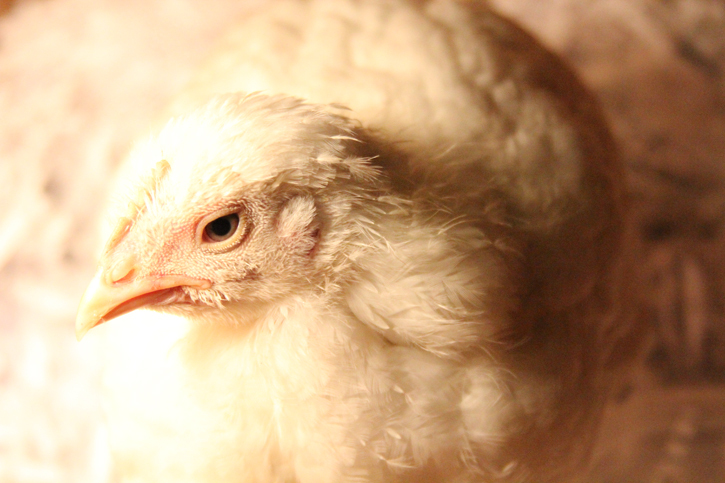 this morning, the last chick was found underneath the coop, with a spot of blood on her side, still alive. seems like the hens kicked it out of the coop last night before the door was closed. she was carried in a box to the kitchen, where i watched her for a few minutes while jason set up her little cage in the greenhouse, a warm place far from the other hens. i hadn’t really thought a whole lot about the whole thing before jason asked me to watch the chick for a moment, but i stood in the pantry with her and stroked her feathers and she peeped and preened and was a suffering animal, just like the rest of us. i don’t know what will become of her, if she’ll survive in isolation, if she’ll grow up to be eaten or if she’ll end up in the compost like the others. i have no conclusions.